Black Swan got out around 9:30. It’s 10:22 and after driving home and letting Macey outside, my hands are still shaking [I wrote this post on Thursday night, for the record]. This could be from the zero degree weather, but that’s not entirely it: Black Swan scared the crap out of me. Seriously. For those unfamiliar with it, Black Swan is the story of a ballerina, Nina, who gets the lead of playing the role of Swan Queen in the ballet Swan Lake. When a new ballerina, Lily, shows up, she becomes paranoid that her role is at risk and pretty much goes psycho. Visit the amazon page and check out the editorial reviews for a more eloquent description. As Nina goes crazier, the intense personalities of these characters are amplified: the mother becomes more controlling, Lily grows more wild and Thomas more sexual. The movie is full of graphic content that is violent, sexual and overall disturbing. Have I mentioned that I was all by myself in the theater? I had to freak out all by myself. Throughout the entire film, I was convinced that some psycho ballerina would sprint in and gouge my eyes out in an unnaturally cruel and unusual fashion. I know watching stuff you know will be disturbing and experiencing absolute terror is an essential part of life, but this was almost a bit too graphic for me. The cinematography, costumes and make-up are all beautiful and the character dynamics are incredibly interesting. 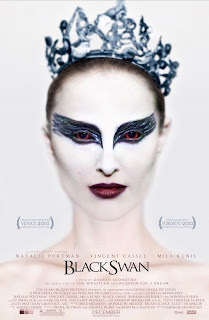 Black Swan is a fantastic and thought-provoking movie, looking back on it afterwards. However, I was honestly too horrified and disturbed to enjoy watching the film. Sometimes I have similar experiences with literature. Let’s use The Sun Also Rises by Ernest Hemingway as an example, which I read as part of a class called The Jazz Age during my senior year of college. For those who haven’t read much literature of the era, let me let you in on a little secret: by and large, it’s pretty depressing. I really enjoyed discussing the literature in class, but let me tell you, reading that many sad books in a row got old kind of quickly. Eventually, each time I picked up a new novel for that class I would just think, “Oh great, another well-written yet sad story about male impotence, the effects of the war, and good things used to be. Let’s get this over with.” I will admit, there were sometimes undertones of hope and yes, I sound a bit closed-minded here. But still, I felt like a lack of hope and over-arching theme of “things are going downhill and they won’t get better” played a big role in these novels, and I understand that they are deep reflections on the era and I can appreciate that, but I am an optimist. I believe the best is yet to come and that the world is full of beauty and wonderful people. Sorry if it’s cheesy, but that’s how I feel. I I think if school had given me more time to read lighter books in between I might not have felt this way. Or maybe next time I pick up a Jazz Age era book I’ll still find that it’s still wonderfully written but just too sad for me to enjoy. I just saw Black Swan and I really enjoyed it. However, I am a horror movie fanatic so not a lot bothers me...HOWEVER, there were some little things in this movie that were very disturbing. I was very squeamish with the whole nail thing. The only book that I can remember offhand that had the same effect was Mystic River. It was so dark and upsetting that sometimes I wish I had never read it. If you're looking for a reputable contextual advertising company, I suggest you take a peek at Clicksor.